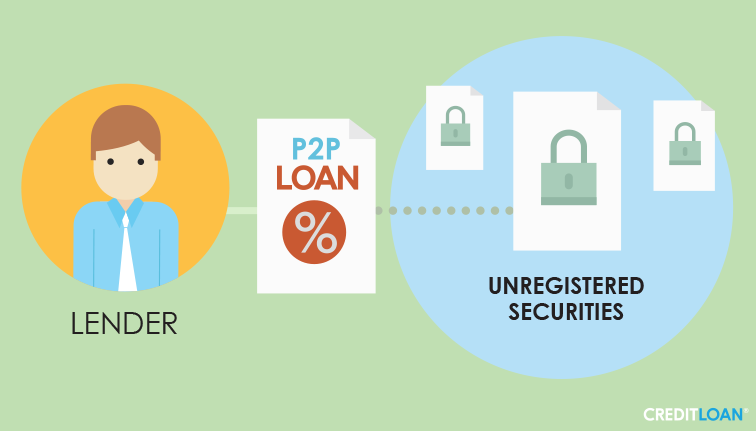 Don’t know which peer-to-peer lender to use? We’ve compared Funding Circle and Peerform to help you evaluate which P2P site is right for you. 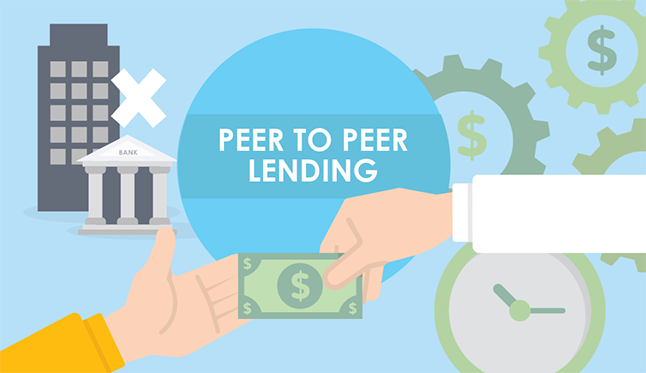 Peer-to-peer lending, also known as "social lending" or P2P lending removes the need for a financial institution by allowing people to borrow and lend money from each other. In order to provide a kind of platform for this lending and borrowing, various P2P lenders have established websites to allow prospective borrowers to check their eligibility and connect with lenders. Two of these such sites are Funding Circle and Peerform. But how do they stack up against each other and are they worth your time and consideration if you need an unsecured loan? In this detailed review, we take a closer look – and you'll be surprised at what we discovered. Keep reading to find out more. How does lending from a peer to peer loan company work? What do you need in order to qualify for a loan from each lender? What do you need to qualify for a loan? Why? Is credit score a factor? Does it have as big an impact as other loans? What interest rates are available? How do they compare to other loans, banks, etc.? What are the pros and cons of each lender? Should You Get a Loan through a Peer to Peer Lending Company? Every peer to peer lending company handles the lending process slightly different than their competitors. In this report, we'll be looking specifically at both Peerform and Funding Circle. For Peerform, very little information is required in order to get a custom loan quote. Because there's no fee to determine eligibility and simply seeing if you're eligible won't affect your credit report, it's an easy and attractive way to learn if P2P borrowing is right for you. The first step for Peerform is to complete the simple registration process, where you input the loan amount you desire, as well as some personal details such as your first and last name, address, phone, email, and your annual salary and wages. Then you can simply upload them or email them to Peerform and you're done! Lenders will then provide competitive rates through the Peerform marketplace. Funding Circle is designed to help small and growing businesses get a loan. You indicate the loan amount you need and how long you need it, and then enter details about your business. The application process takes less than 10 minutes and decisions are made in as little as 24 hours. Up to $500,000 is available in small business loans. Borrowers know up-front what their repayment schedule is, and there are no hidden fees. Funding Circle charges an origination fee of anywhere from 0.99%-6.99% on each loan. For Peerform, you'll need to supply the information required above (for identity verification) as well as basic personal details. In order to borrow from Peerform, you'll pay an origination fee which covers your credit check. Peerform uses credit checks to assess the risk of the loan and to set your interest rate. Peerform typically approves loans to borrowers with lower credit scores, but they will not approve loans to borrowers whose credit score falls below 600. There is no proof of minimum income needed. If your credit history is limited because of past financial history or your age, you'll be glad to know that Peerform only requires one year of your credit history. For a business loan from Funding Circle, you'll need to complete an application as well as provide some other information depending on the size of the loan you're looking to get. Outstanding business loans and credit worksheet – available upon request. There are many factors considered when it comes to loan approval. For Peerform, you'll need to have a minimum credit score of 600, although a minimum income is not required. You'll also need a minimum credit history of one year and a maximum debt-to-income ratio of 40%. There's no pre-payment fee and repayment terms are three years. One drawback of using Peerform is that obtaining a loan from them is not possible in all 50 states. You can find more information on Peerform's website. For Funding Circle, your credit score is also considered, but so are a number of other factors, such as real time cash flow and even customer reviews of your business online. Every applicant has a loan specialist that they can talk to throughout the application process. When you submit your application through Funding Circle, your loan specialist will let you know if you were approved within 48 hours. Like with Peerform, there is no loan pre-payment penalty. 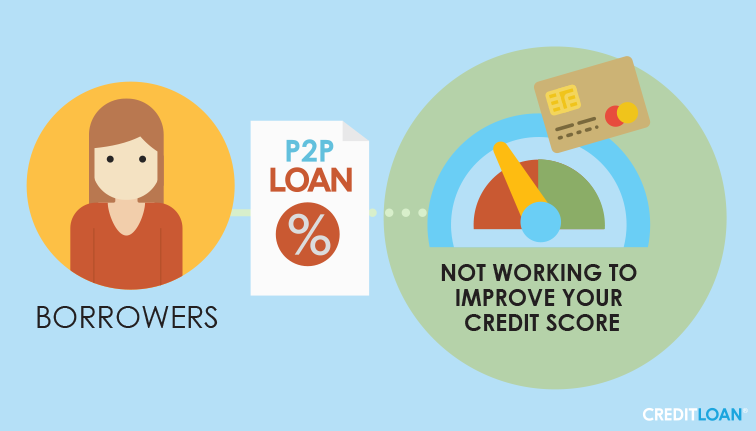 Credit scores are a factor in P2P lending – but it is not the only factor. In the case of Peerform, your credit score is used to assess the risk of appropriating a loan as well as setting the interest rate. Funding Circle looks at credit scores as well, but also not to the extent as traditional types of loans. They do what is known as a "soft pull" on your credit. This means that it does not impact your credit score or show up on reports that other lenders may obtain. Peer to peer lenders tend to take on those borrowers that traditional banks would turn down, so while getting a peer to peer loan is the same as any other kind of loan in terms of setting up a repayment schedule and understanding interest rates – the threshold for application tends to be lower than at financial institutions. Interest rates from both Peerform and Funding Circle vary. With Peerform personal loans, your creditworthiness is defined with a clear rating structure, known as a Peerform Grade. This grade determines the interest rate and APR that you pay. 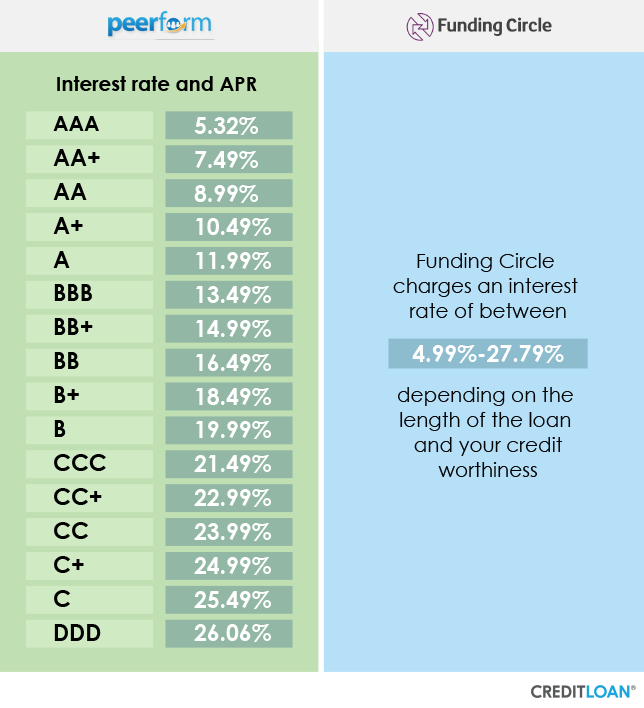 Funding Circle charges an interest rate of between 4.99%-27.79% depending on the length of the loan and your creditworthiness. Overall, many people who ended and who have good or excellent credit scores find that they get a much more competitive (or even lower) interest rate than what they would get from banks. Those with lower credit scores typically pay more – however, each person's experience varies due to their creditworthiness, how much they need, and the length of their loan. Every lender is different and has their own benefits and drawbacks. Here are some of the more notable pros and cons we found out about Funding Circle and Peerform. Peerform lets you check your rate without going through the application process, which won't impact your credit score – something credit report watchers will find very helpful if they're looking to minimize dings on their credit score. The lowest interest rate currently available from perform is 6.44% with an APR of 7.12%. Their minimum credit score in order to be approved is 600, which is lower than other P2P lenders. Most people find the application process very straightforward, and for those with good credit, the rates are competitive if not better than traditional banks. The downsides of using Peerform are that they do have a check processing fee of $15 if you elect to pay by check, and the maximum loan term you can apply for is 36 months (three years). The application process can take anywhere from 24 hours to two weeks, which makes the latter a considerable wait time, considering that most P2P lenders approve applications between 24-72 hours. Peerform also has the lowest maximum loan amount ($25,000) available of most P2P lenders. Because they only deal in personal loans, those small businesses looking for a loan may be better served by Funding Circle. Funding Circle only deals in small business loans, so individuals looking to get a personal loan may be better served by Peerform or another P2P lender. Funding Circle does offer one of the largest maximum loan amounts available – at $500,000. Approval time is up to 72 hours and the lowest interest rate is 5.49%, making Funding Circle a very lucrative choice worth your attention if you're a small to medium sized business owner. On the other hand, there are some notable drawbacks. For one, you cannot check your rate unless you apply through Funding Circle's website. The loan terms are much more varied, however, and you can get a small business loan term for anywhere from 1-5 years making them a bit more flexible in terms of small business loans. What are the maximum and minimum loan amounts for each lender? The minimum loan amount for Peerform is $1,000 while the maximum loan amount is $25,000. For Funding Circle, the minimum loan amount is $25,000 and the maximum is $500,000. Peer to peer lending has its share of risks and benefits to both the lender and the borrower. On the surface, peer to peer lending removes the middleman (the bank or financial institution) from the equation, but the process itself is more involved and time-consuming than traditional lending systems. For borrowers, if you don't want to deal with the banks, or have been turned down for a personal loan in the past, peer to peer lending is a viable alternative. If friends or family can't (or won't) loan you money, and you need to get your hands on cash quickly, P2P lending can be the answer you're looking for, and help you avoid accumulating any more credit card debt. For investors, P2P lending represents a highly untapped opportunity to diversify investments and earn some passive income on the side. With peer to peer lending, there are no physical branches such as those you would find at a bank. Instead, platforms like Funding Circle and Peerform charge origination fees to borrowers and deduct fees from the loan repayments made to the investors. This, in turn, lowers costs for borrowers and has the potential to increase returns for investors – a win-win for both parties. You may be interested to know that banks are not completely excluded from the P2P lending process. Industry leaders Lending Club and Prosper make their loans available through WebBank, an industrial bank chartered in Utah. Many banks are discovering that it's better to ride the waves of social finance change rather than fight the current. But peer to peer lending is not without its risks, as we discovered. Lenders have few assurances that borrowers will repay their loan. One benefit of going the traditional banking route is that banks and other financial institutions may have rejected this same borrower due to a high likelihood of default. The P2P marketplace has no such oversight. However, the amount of interest charged to borrowers accepting P2P loans is typically higher than prime loans, an attempt by the P2P platform to help offset the risks to lenders. What are the risks for both the lenders and the borrower? Peer to peer lending hit its stride in the mid-2000s – right around the time that the Great Recession started making many borrowers disillusioned with banks and the whole lending process. 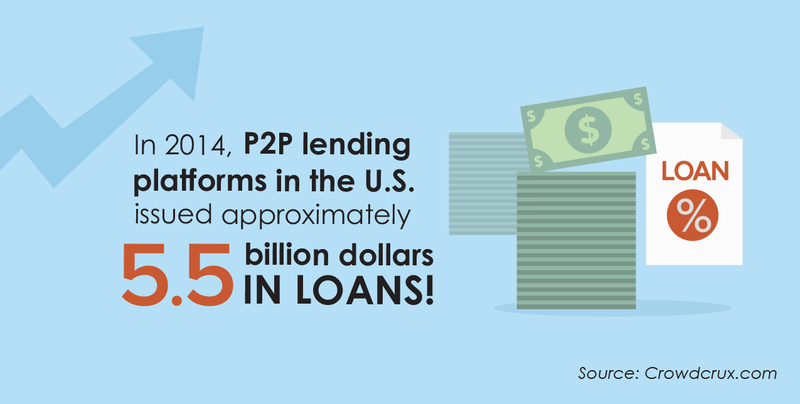 Since the beginning, many P2P lending platforms have experienced exponential growth. This, in turn, can lead lenders to believe that lending via these platforms is relatively safe compared to the rollercoaster ride that is the stock market, or other traditional investing strategies. But there are numerous risks that both lenders and borrowers should be aware of. For lenders, the biggest risk is that the borrower will default on their loan. P2P loans are not insured, and back in 2008, peer to peer lending giant Prosper found itself in legal hot water when the SEC sent them a cease and desist order claiming that they were selling unregistered securities. A year later, Prosper course corrected and got SEC registration for its loans. Now, all P2P lending platforms are required to secure SEC registration – something that accredited investor groups have been keenly watching and involved in for some time. While borrowers don't face the same kind of direct risks that lenders do when considering a P2P platform, there are still some broad, underlying points that any borrower should consider before they tap into social lending. Perhaps the most important risk is not working to improve your credit score. If the banks won't give you a loan and your credit cards are all tapped out, why should a P2P lender consider your request? Of course, a P2P loan looks good on the surface and is relatively easy to get, but that convenience comes at a price – you'll end up paying hundreds more in interest. As a borrower, the most important thing you can do to avoid falling into this trap is to put a stop to poor financial habits. At its core, a peer to peer loan is no different than any other kind of loan – if you miss a payment or default on your loan, it will show up on your credit report, just like missing a payment on your mortgage or auto loan. If you use credit responsibly, there's no reason not to take out a peer to peer loan for quick, emergency cash – just don't use it to continue to fuel bad spending habits! At their core, Peerform and Funding Circle are two very different companies looking to attract two very different audiences. Peerform doesn't do business loans, and Funding Circle doesn't do personal loans, so in some cases, it's like comparing apples to oranges. Both focus on social lending, however, and both use state of the art platforms to help connect borrowers to lenders. Both companies place a high priority on customer service and attentiveness, as well as the security of your personal information, so you can rest assured that multiple steps are in place to safeguard your financial and personal details. Without a doubt, peer to peer lending has put a fresh spin on a traditional (and some may argue, stagnant) funding market – cutting out the middleman and connecting borrowers and investors on an entirely new level. New as it is, however, for borrowers, the same principles apply as when getting any kind of loan – be responsible, pay it back according to your repayment schedule, and take steps to improve your overall credit history. Peer to peer lending is certainly worth trying if you've been unsuccessful with banks in the past, and want a fresh shot at getting the funding you need – especially for emergency expenses. P2P lending has taken the approval process and sped it up considerably, so in most cases, you're not left to wait and wonder if you got approved. They've also streamlined the process, so checking your rate or going through an application is refreshingly simple and fast. Both have notable benefits, such as Peerform's fast loan acceptance and a lower credit score threshold to apply – or Funding Circle's high business loan amounts and flexible terms. In the case of business loans, Funding Circle does offer attractive benefits, but it is not designed for start-ups – you must have been in business for at least 2 years before you can apply. On the plus side, however, you get a dedicated account manager and a personal underwriter that you can ask questions to or get support from any time you need it. Both companies offer customer service Monday through Friday, but no weekend hours are available. Support is available by phone and email. So as you can see, it's not so much of a showdown when you're targeting very different audiences with very different goals in mind. But both of these companies are a testament to the exciting opportunities that are blooming in the peer to peer lending arena – as they both have a solid track record of lending and are generally more flexible when working with borrowers. If you think that your small business would benefit from a loan to help buy more equipment or hire more employees, for example, then Funding Circle is definitely worth a look. On the other hand, if you need fast cash for unexpected repairs and bills, and don't have time to wait for a bank to approve you, Peerform may be just the help you need in a pinch. Be sure to read all the fine print carefully and be sure you understand the rates and repayment schedule as you'll be committed to paying back your loan at this amount and time frame – just as you would any other loan. Give either one a look depending on your particular needs and put your loan worries to rest – the future is here and it's peer-to-peer!